As Instagram has proven, everyone loves cherry blossoms and I am no exception. Fun fact, a dream of mine is to see the cherry blossoms in Japan, that's going to be fabulous one day. They are soft and delicate symbolizing fragility and the beauty of life. Cherry blossoms remind us to make the best of every moment. 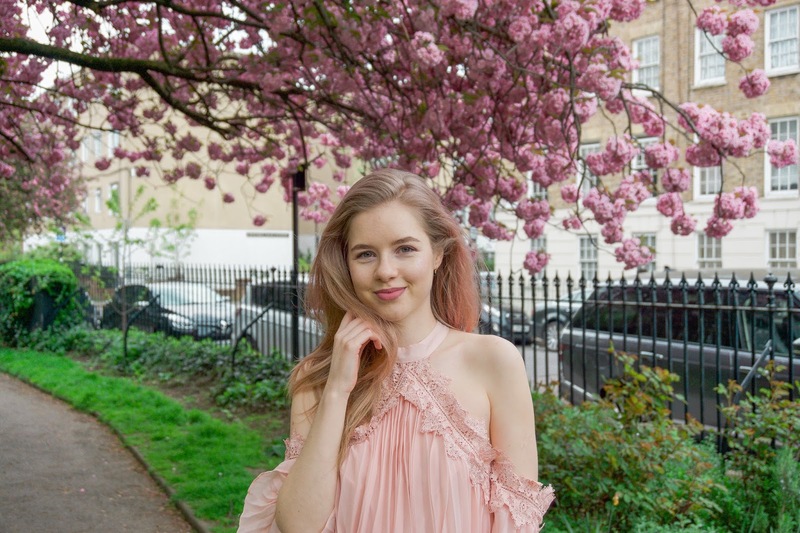 To compliment the delicate cherry blossoms I chose a soft blush pleated dress with lace details and cold shoulders. Also, pink hair!!! Woooo! Some of you might remember me with pink hair from last spring - see here. Once again I opted for the L'Oreal Colorista Washout, so it's only temporary but ohh so fun. Would you change up your hair for spring?